Is it morbid, my recent fascination with the headless black body, or my desire to tell the stories of headless black people? I’ve told some friends already about one of my stranger (even scarier) moments in Glasgow. I was walking on Sauchiehall Street, passing the All Saints store, and saw their window display. The mannequins were all black. They were all headless. And they were all swinging from chains! Imagine that – the one time I was able to see myself represented in a high-street fashion store, I was being lynched. I found out subsequently that these displays had been up for a long while – since 2007 and other people across Britain had had my reaction and complained. It was clear, however, that the store loved the controversy. They gave a half-hearted response about it being edgy, about it being arty, about the mannequins being grey and not black, and they left it like that. You can read about that here. If you think about it, headless black bodies are everywhere, sometimes in the most seemingly innocent of places. In cartoons for instance. 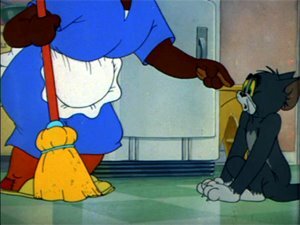 Do you remember Tom and Jerry? Do you remember the headless black woman? The one who always shouted ‘Thoooomaaasss!’ Her name was Mammy Two Shoes, and for a while I have wanted to write a poem, or even a sequence of poems for her. I’m sure I will, so watch this space. And I also remember the bizarre moment when a white-American girl told me how she had visited Jamaica, and how she had loved driving on all the country roads, and how gorgeous all those shirtless Jamaican men were. She said she had never seen bodies so beautiful. But then she stopped to consider this. She corrected herself, ‘They weren’t always very handsome. Sometimes I wished I could take them without their heads.’ Strange that – how on one hand she could fetishize the black man, even while she beheaded him. Or maybe that was precisely the fetish.